Are you struggling to find homework for kids that is meaningful, yet practical for your (super busy) classroom? If you’re looking for a simple way to manage homework, updating your homework policy before back to school, or are searching for some facts about homework to inform your homework practices (even if that means saying “NO” to homework), then you’re in the right place my Super Teacher friend! Homework menus (a.k.a. homework choice boards, or homework tic-tac-toe boards) are a nontraditional approach to homework that you can flexibly use to meet the needs of all your students and get your homework management system on autopilot! What is a homework menu? A homework menu is simply a choice board that gives students a number of options for homework. You decide how many options students should complete each week. It’s as simple as a table with 20-25 boxes of possible assignments. What are the benefits of using homework menus? *Homework menus are an easy way to differentiate homework in a way that’s practical for teachers to assign and grade. Plus they give you tons of flexibility, since you can vary the options month to month. *Homework menus give students choice within a structure and can be easily adapted to what you have already taught in class. Differentiation through choice can save you a whole lotta headaches with parents who don’t feel a one-size-fits-all homework program is right for their child. *Grading is very doable! Students only need to turn in homework once a week. There are a few different ways to handle turn in of assignments for students who can’t handle the once a week turn in option. I use homework bookmarks (one of these is included in the freebie) for 99% of my kids and a daily homework tracker for the kiddos who need a bit more daily accountability. *If you’re on the “Zero homework” end of the spectrum, but are required by your district, administration, or even parent pressure to assign homework, then menus can be a great solution! You can include exercise, listening to music, hanging out with family, or practicing mindfulness as menu options. You are still assigning homework, but getting to choose menu options that you know are really important for kids in your own sneaky Super Teacher way! How is using homework menus like having homework on autopilot? This still sounds like work. Well, yes. 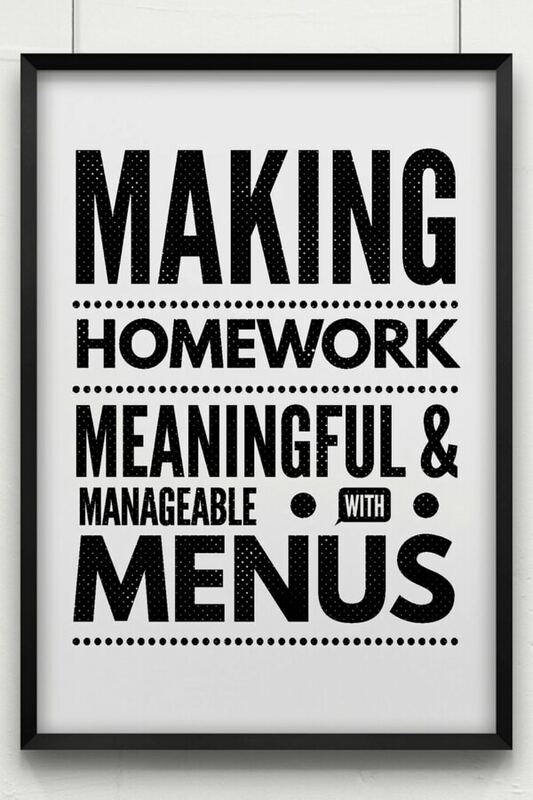 Homework menus are not magical, but they are super easy once you get them set up (promise!). You will need to set up the monthly homework menu and have options for students. However, many of your options can be used every month (like home reading, mindfulness, exercise, or practicing math facts), so you’re not coming up with 25 brand new options every 4 weeks. If you download the freebie, you will already have a choice board template with 15 homework options you can edit to meet the needs of your own classroom. Once you get the homework menu system set up, you can use this flexible structure ALL YEAR LONG! You only have to create one menu a month and collect homework assignments once per week. So much better than struggling to get the copier to spit out stapled packets every weekend! 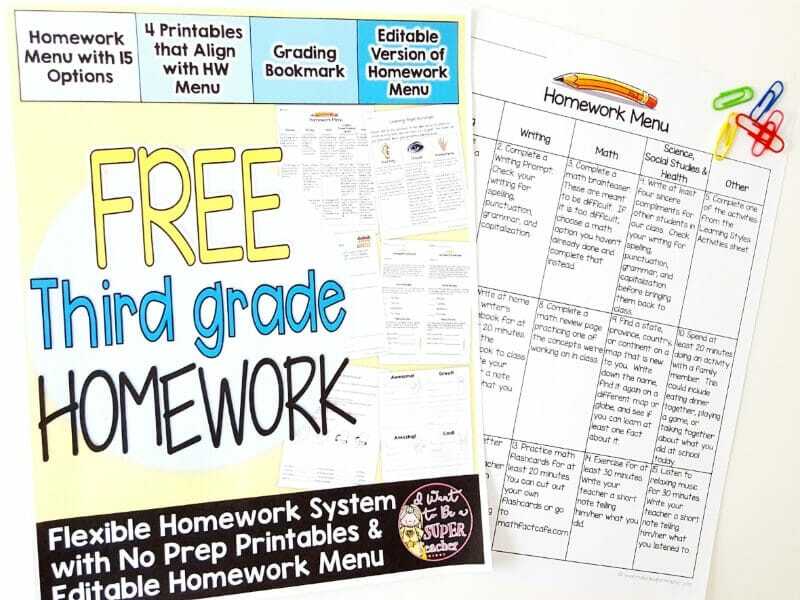 The third grade homework menu and printable freebie includes a homework menu/choice board template + 4 corresponding printables, a homework bookmark for grading, and an overview of homework research. The printables are geared towards 3rd grade, but since the menu itself is EDITABLE, this freebie can work for any grade. 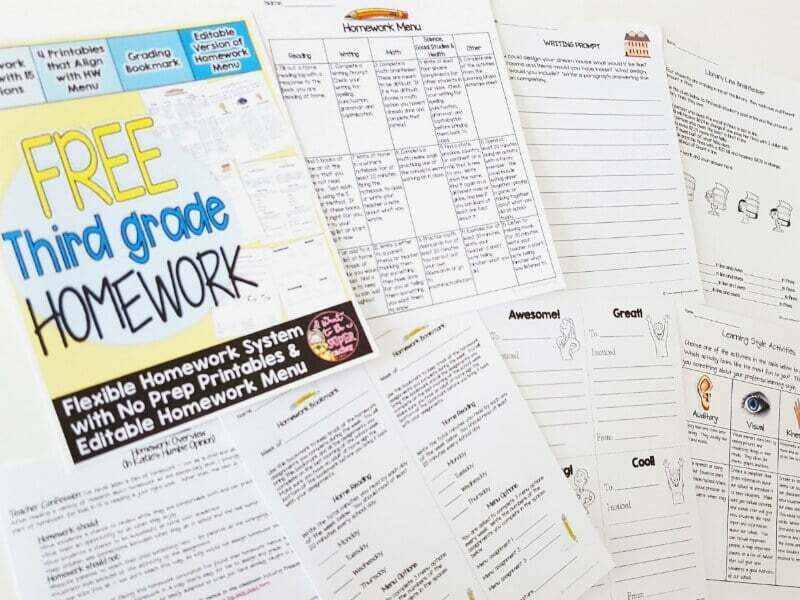 Plus you can pick up the free editable homework menu (and 4 corresponding printables) while you’re there!